Gadacz, René R.. "Wigwam". The Canadian Encyclopedia, 10 April 2019, Historica Canada. https://www.thecanadianencyclopedia.ca/en/article/wigwam. Accessed 22 April 2019. A wigwam is a domed or cone-shaped house that was used mainly by Indigenous peoples and was prevalent in the eastern half of North America before the era of colonization. Today, wigwams are used for cultural functions and ceremonial purposes. 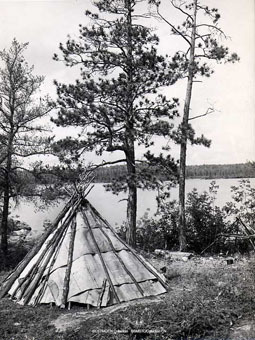 Wigwams used by the Eastern Woodlands hunters. 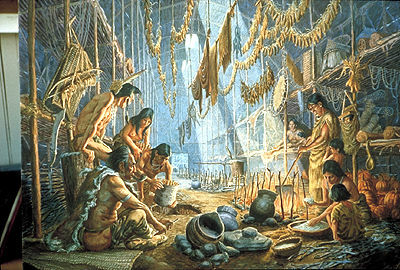 They were covered with birchbark, skins or mats (artwork by Gordon Miller). 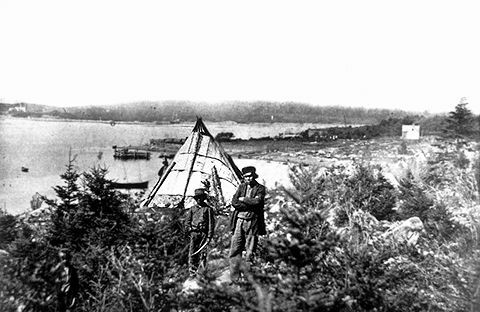 Ojibwa at Lake Winnipeg, Manitoba, 1884 (courtesy Geological Survey of Canada/595). 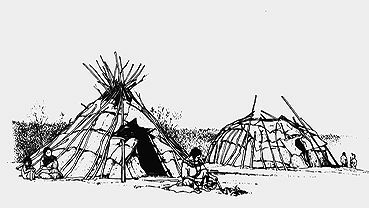 A wigwam was a type of house used mainly by Algonquian peoples but also other Indigenous peoples in the eastern half of North America in precolonial days (see Indigenous Peoples: Eastern Woodlands). Wigwams had a dome or cone shape, and were typically made out of wood. Sometimes, animal hides would cover the outer walls of the structure. Wigwams were built for easy disassembling and reassembling so that hunting parties and travelling families could have shelter in their new location. Typically, wigwams were used for shelter. They were places where families gathered to socialize, eat and sleep. Although the size differed depending on the family and community, these family dwellings could hold up to 10 or 12 people. Wigwams could also be used as houses of worship or for community meeting places. 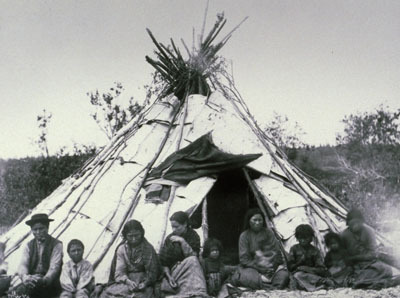 In these cases, wigwams were larger, and could fit about 25 occupants. Wigwams were built on a level area. Wooden poles (sometimes measuring 5 m long) were placed upright, and the top ends were gathered together and bound, often using spruce roots or other natural binding agents. Once the basic dome or cone structure was completed, shorter wooden poles were fit in between the larger poles and also bound together. Large strips of bark or animal hides were wrapped around the frame in layers and then sewn to the structure. Moss or grass mats were sometimes packed around the bark to protect against rain and heavy winds. Doorways were covered by animal hides. Inside, wigwam floors were covered with tree boughs and blankets made of animal hide, making it comfortable to sleep and sit on. Women also often decorated the inner walls with designs of nature or animals. At the centre of the wigwam was a fire pit, where families gathered around to cook, eat and talk about their day. The smoke from the fire escaped through a hole at the top of the wigwam. 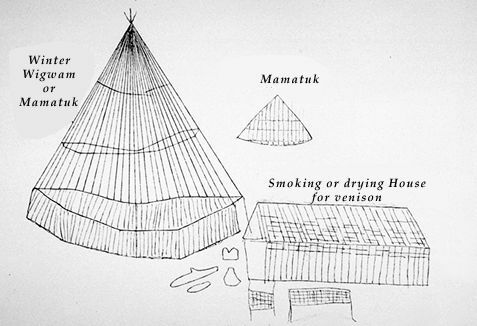 On the East Coast, some Indigenous groups, such as the Beothuk and Mi’kmaq, built wigwams that were more rectangular in shape and resembled log cabins. 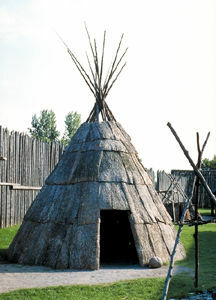 However, the general construction and use of the wigwam was very similar to other Indigenous groups. (See also Architectural History: Indigenous Peoples). Although wigwams are no longer used as primary dwelling locations, they still serve ceremonial and cultural purposes. Community meetings, rituals, feasts and festivals are just some of the reasons for which people today might use a wigwam. Bruce LaFontaine, Wigwams, Longhouses and Other Native American Dwellings (2004). Cora J. Voyageur, ‎David Newhouse and ‎Dan Beavon, Hidden in Plain Sight: Contributions of Aboriginal Peoples to Canadian Identity and Culture (2011).